For this history “blog” I enjoy writing about Volusia’s rich history of notable people, including the last living Civil War general, internationally famous African Americans, nationally honored novelists, baseball Hall-of-Famers, and a world-renowned sharpshooter. It’s been six months since I started, so this week I want to make it easy (especially for newer readers) to be able to click to read a piece from weeks or months ago. Last week’s story about the 1937 DC-2 crash at the Daytona airport interested many people. The piece includes the names of locals who rescued the survivors and also the names of streets and locations that are still of interest today. In 1937 most of what is today’s airport was a dairy farm. If you want to read this story, click here. The Great Freeze of 1894-95 destroyed most of Volusia’s citrus industry, and this is recounted along with the other major Volusia freezes in a piece that tells about the year that the St. Johns River froze more than 50 feet from its banks. If you want to read this story, click here. Holly Hill’s Prohibition-era rum-runner, Bill McCoy, also interested many readers. The story tells how he cleared $100,000 for each smuggling run from the islands before his capture by revenuers, and the story includes many specific references to exact locations still identifiable today. It also explains how his smuggled booze gained such a good reputation for being undiluted that the phrase “The Real McCoy” brought him national fame. If you want to read this story, click here. Stephen Crane, one of America’s greatest novelists and short story writers, was shipwrecked in Daytona in 1897. The story tells about his involvement in gun-running to Cuba and also the crew’s struggle to get to shore during a deadly storm after their ship went down off New Smyrna and their tiny row boat drifted for days in the storm before their deadly attempts to come ashore near the location of today’s Daytona pier. If you want to read this story, click here. Before Crane came to Daytona he was involved with a madam who ran a bordello in Jacksonville. Afterward, they posed as husband and wife. If you want to read this story, click here. The Atomic Tunnel in 1950’s Port Orange was a roadside tourist attraction that billed itself as a converted nuclear bomb shelter. Inside a meandering stucco-covered tunnel that connected round pod-like rooms, tourists could see exotic tropical plants, colorful macaws (parrots) that flew loose through the tunnels with the tourists, and even a catfish that would “walk” from one water pool over a sand barrier into another water pool. The story also tells about the beautiful local model who promoted this pre-Disney attraction. If you want to read this story, click here. The Bloodiest Battle of the Civil War was fought in New Smyrna. The story includes details about the maneuvers, the firing of the canon through the New Smyrna hotel, the escape, and other details, including the naval blockade of Mosquito Inlet (today’s Ponce Inlet). If you want to read this story, click here. The last living Civil War general lived in Ormond Beach, and Ames Park is named for him today. This story tells his story, the history of the park, and includes details about his Ormond home. If you want to read this story, click here. World War Two teenagers’ remembrances of life in Daytona during the war. This story includes memories of local beachside lookout towers to spot enemy ships and planes, blackouts, beach restrictions, rationing of silk stockings and sugar, War Bond efforts, and tar balls on the beach after German ships sank American ships along Daytona’s coast. If you want to read this story, click here. Ormond Beach’s votes in the 1876 Presidential election were the deciding votes to win Florida for Rutherford B. Hayes. The story tells about John Anderson’s successful plan to fool robbers into stealing a false ballot box on its way to the county seat while the real ballot box was secretly being taken on backwoods trails by Loomis Day, son of the man for whom Daytona was named. If you want to read this story, click here. Stan Musial’s season with the Daytona Beach Islanders was the year he dove for a fly ball, injuring his pitching arm; and after leaving Daytona he was no longer a pitcher. Instead, he was beginning his career that made him a Hall-of-Famer. The story includes many details that I found in the dozens of baseball stories that I read in the 1940 Daytona Beach Morning Journal newspapers that covered his season in Daytona. If you want to read this story, click here. Casey Stengel stood on a Daytona bridge in 1915, contemplating suicide. This story tells about the disease he contracted in a “shady” section of Daytona and also recounts in detail one of baseball’s greatest pranks of all time–when Casey fooled his manager who was attempting to catch a baseball dropped from an airplane above Daytona’s ball park on City Island. Casey’s prank involved secretly dropping something that wasn’t a baseball, 525 feet to his unsuspecting manager. If you want to read this story, click here. Daytona’s forgotten African American communities around 1900 were Waycross, Newtown, Midway and Silver Hill. Their specific street locations are included in the piece. If you want to read this story, click here. Freemanville, the first African American community in Volusia after the Civil War, was in Port Orange. This story tells about its beginnings in the 1860’s up to about 1900. If you want to read this story, click here. Freemanville’s history up through the 1950’s is the topic of this second story on the community. The piece includes specific streets that made the boundaries of the community and also the locations of the canals (still visible today) and its historic cemetery. It also includes links to Google maps to view the canals and streets from overhead. If you want to read this story, click here. The now famous African American novelist, Zora Neale Hurston, lived on houseboats along Ballough Road in Daytona Beach for several years. This story tells about her teaching at Bethune-Cookman College and also about her life and writings while living in Daytona Beach. If you want to read this story, click here. Daytona-born Howard Thurman was named by Look magazine as among the 12 most important religious leaders in America. This story tells of his boyhood in Daytona, the location of his home, exactly where he was baptized in the Halifax River, his rise to fame, and his influence on Martin Luther King, Jr. If you want to read this story, click here. Historic Gethsemane Cemetery, Ormond’s oldest African American cemetery, quietly sits along Orchard Avenue. This story tells about its beginnings and its restoration. If you want to read this story, click here. 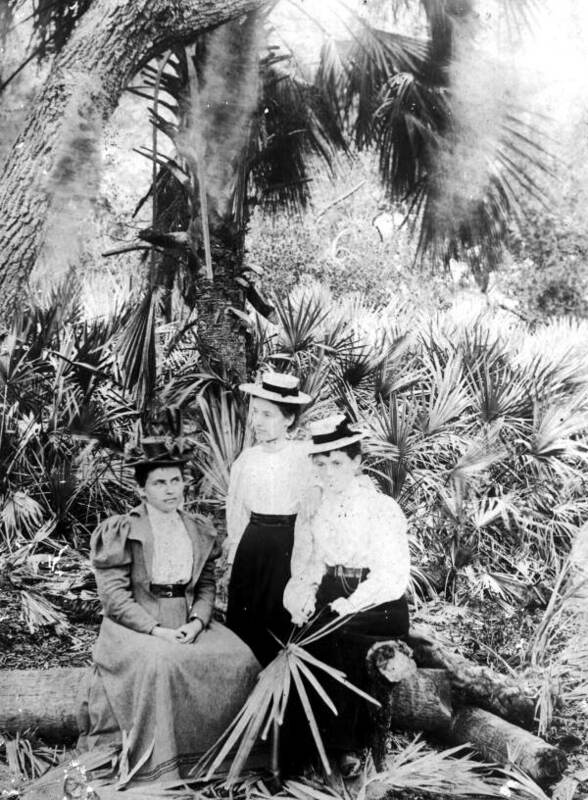 Volusia’s Timucua Indians lived where Tomoka State Park is today. This story tells about their pre-Columbus village, Nocoroco, and gives locations of various Timucua tribes and also explains the various Timucuan dialects and tells what became of the Timucuas. If you want to read this story, click here. World-famous sharpshooter Annie Oakley was crushed in a car wreck north of Daytona. This story tells the details of the wreck, her convalescence in 1922 in Dr. Bohanan’s hospital (including the street location and a link to a 1916 map), and her successful return to shooting contests. If you want to read this story, click here. Daytona and Ormond raced to complete the first bridge across the Halifax River. This story tells the history of the first five bridges built and also about the tiny towns that existed on the beachside back then, including Seabreeze, Daytona Beach, and the fledgling hopes for communities called Goodall, East Daytona, and Memento. If you want to read this story, click here. Coyotes now live secretive lives throughout Volusia County. This story tells about my sighting of a coyote and also about the history of the coyotes’ return to Florida, information about their size, food, and habits, as well as accounts of recent coyote attacks in Volusia. If you want to read this story, click here. To read other stories, go to the “Categories” on the right-hand side of the page to click any topics that interest you. I hope you’ll submit some of your own historical comments after reading some of the pieces on the blog site. Dear Denny: The following book records President and Mrs Herbert Hoover’s visit to New Smyrna while he was president. Kelly,G. M., 2004, Sequoia, Presidential Yacht. Tidewater Publishers, Centreville, Maryland, 122 p. My mother dressed me (age 3) in a sailor suit and took me to see it take on gas at my uncle Pat Sam’s Gulf Oil dock. I remember only men in straw hats, seemingly high above but maybe they were on an upper deck or the tide was high. Certainly I was short. See Chapter 3. A request for snapshots of this event by residents might get a response. Enjoy your articles. I lived in New Smyrna until going to Japan in the Army in 1946 and occasionally still visit, last a week with photographer Jack Mitchell in Jan. 2013, before his death. Best wishes, Edward C. Wilson.